Donald Trump Ramps Up His Fundraising After A Week Of Bad News And Falling Polls The Republican nominee has 21 fundraisers planned in the next 31 days — but amid falling poll numbers and a series of stumbles, some big Republican donors may not contribute to Trump's campaign. 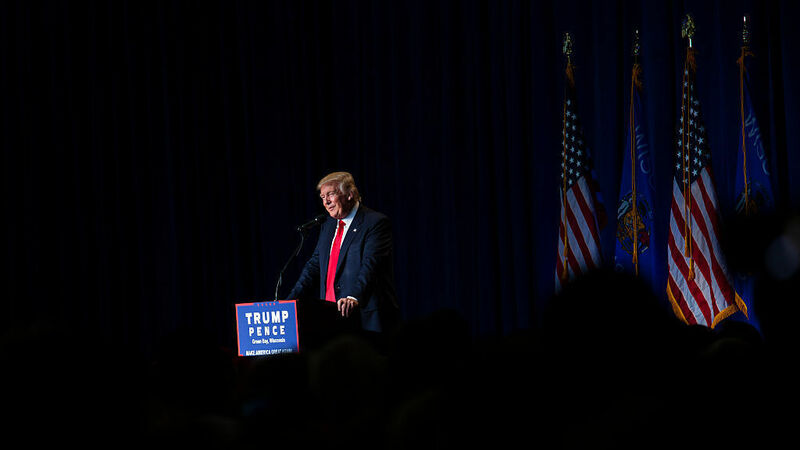 Republican presidential candidate Donald Trump speaks at a rally on August 5 in Green Bay, Wisconsin. As President Obama settles in for his summer vacation on Martha's Vineyard, Donald Trump will be just 14 miles across the water at a Cape Cod mansion, raising money for his campaign. The reception, and another one on Nantucket, will help launch an intense month of soliciting by Trump: 21 events in 31 days, according to a calendar of the Republican National Committee. The campaign said Trump raised a record $80 million last month for the campaign committee and Republican National Committee, just $10 million short of Hillary Clinton's operation (Official reports are due Aug. 20). For the first time, Trump's fundraising machine seems to be in high gear. But the ambitious August fundraising schedule begins amid rubble left by Trump's latest rhetorical blunders. He attacked the parents of a Muslim U.S. Army officer who was killed in Iraq, claimed to have seen a controversial video that didn't exist, tried to joke about a Purple Heart medal given to him by a combat veteran, and mocked the mother of a crying baby, among other things. His poll numbers have been sinking, and some big donors are taking note. Trump spokeswoman Hope Hicks said Friday, "The fundraising operation continues to be incredibly successful." But outside the campaign, there's doubt, or worse. "Quite a few people are concerned about the winnability of the presidential race," said Fred Malek, a veteran Republican official and fundraiser. "I don't sense panic. I sense concern." Others were more emphatic. Big donor Stanley Hubbard proposed a strategy for Trump: "Connect his brain to his mouth at all times, and not just say things that come into his head without thinking." Hubbard, of St. Paul, Minnesota, is a broadcasting magnate with a long history of political giving, mainly to Republicans. He gave $50,000 to the pro-Trump superPAC Great America, after supporting other GOP primary candidates and donating $10,000 to an anti-Trump superPAC. Connect his brain to his mouth at all times, and not just say things that come into his head without thinking. He told NPR he's talked to "so many people who are disillusioned with both candidates," and wondered if this may be the first time in American history that voters should choose an independent. He likes Libertarian Gary Johnson, a former governor of New Mexico. "He was a good governor," Hubbard said, adding, "He's gotten away from this idea of legalizing marijuana, which to me is a non-starter." Hubbard donates $100,000 a year to Freedom Partners Action Fund, the superPAC hub of the network headed by billionaires David and Charles Koch. Network donors gathered last weekend and debated whether to put money into supporting Trump. The Kochs argued no and won. Hubbard said he arrived wanting to back Trump and left persuaded otherwise. The Koch network is defending House and Senate Republicans, "as a firewall against either [presidential] candidate wanting to do something crazy," Hubbard said. The Cape Cod reception, by coincidence, is at the mansion of Bridget and Bill Koch – brother of David and Charles. Like them, Bill Koch is an energy-sector billionaire. Unlike them, he's putting money on Donald Trump. Admission ranges from $2,700 to $50,000 per person, depending on the level of access to the candidate. Mr. Trump has proven to be very resilient. Two volunteer fundraisers for the event said they saw no evidence of donors backing away from their support for Trump due to his recent stumbles. Amy Carnevale and David Tamasi are both on the host committee, which requires giving or raising $10,000. Carnevale, a Trump delegate at last month's Republican convention, said the event met monetary expectations. "Mr. Trump has proven to be very resilient," she said. Tamasi, a Cape Cod native who's now a Washington lobbyist, said, "We've not been experiencing any people who are abandoning the event, or are not returning calls and no longer expressing interest." This cycle, his third as a presidential moneyman, he supported two other Republicans earlier in the primaries, and then went with Trump. "My plan was to always support whoever the nominee was," Tamasi told NPR. "So in this instance it's Donald Trump. And I think that you support the party, and you support your nominee, and we'll see what the next few months bring."